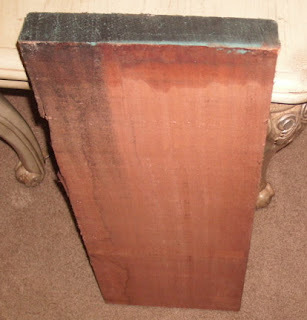 Making a Guitar: Purchasing the first block of wood. Went to the hardwood store on a bright and sunny late January date probably the 22 or 29th. 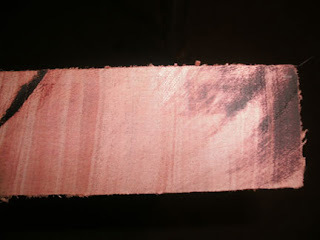 I was looking for mahogany quarter-sawn (meaning the grain rings are running close to 90° angle to the face of the wood. It was difficult to pick the right peice out because they paint and/or wax the ends of the wood. I wasn't sure whether I was looking at grain or saw marks. but I found a piece I thought would be good. When the yardman cut the wood, and I could see the grain, I knew that it was a pretty good choice. Not perfect but as I've read, Mahogany is a pretty forgiving and semi stable wood. After I rough-planed the board I noticed how beautiful this board was and can understand why some people even use this wood for the back and sides of the guitar. There is enough wood here to do about three necks... or at least be able to mess up twice. This board cost almost $30. I wish I had a cheaper source, but there's something to be said for going to a lumberyard and touching the wood. I'm deciding what the wood is going to become – instead of buying a blank that somebody else designated to be a guitar neck... Silly maybe but it's the way I want it. 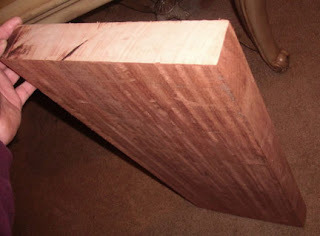 The wood most people use (or prefer) is South American, Central American or even Western USA Mahogany. This is actually not that type of wood. 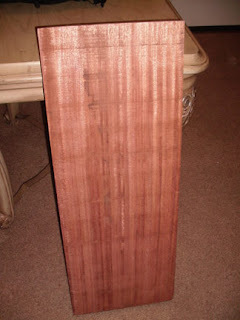 It is African mahogany. Many luthiers do use African Mahogany and you can purchase blanks of African Mahogany necks, so I'm sure it's ok using this wood. Very happy with this choice.